So Michael Robertson has introduced AjaxWrite as a web-based word-processor. Nice idea, except what formats does it save to? MS Word, RTF, Text and PDF. How about HTML+CSS - it's how you're displaying the damn thing to me after all - how hard is it to store it in that format? This is not a new question - after all CSS is more capable than Word's internal styling. How about a Document Microformat? We can call it HTML for short. David Hornik wrote a post comparing VC and buyouts to the TV show Deal or No Deal. Now, my sons like watching this show, and I don't mind as it is a great lesson in probability. The expected value is pretty easy to calculate (sum of remaining amounts divided by number of remaining suitcases), so you have an objective valuation to compare the banker's offer against. Doing the calculation in your head isn't that hard, as you only need to sum up the top few amounts — lower ones don't significantly affect the outcome. The offers from the banker are consistently below the actual expected value, until they get down to a small number of cases. At it's core, this program is in the same Greek God model of reality TV I have discussed before; unlike "Who Wants to be a Millionaire", which has a skill element alongside the "stop or continue" calculation, it is playing on the fact that knowledge of probability is not something that has been evolutionarily selected for, and thus needs to be painstakingly learned (if you doubt this, look at the city that probability built, Las Vegas). This reveals itself in Howie Mandel saying flagrantly untrue things like "there is a good chance you have a million dollars in your case" when there are 20 left, and so the chance is 5%, and indeed in the way the producers seem to be trying hard to get someone to win a million (which is hugely unlikely given the game's form, as when you are left with 2 cases, the buyout offer is very easy to calculate) - to the point where they are adding in cases with $2 million and $3 million in. So how does this fit with Hornik's analogy? One thing that is clear is that if there isn't an objective way to value what you have, it helps if there is more than one banker to make you offers. If it is just Google, Yahoo or Microsoft, then the entrepreneurs may be in a take it or leave it situation, but if there are competing bidders, they have a better chance. It is this that makes sense of the otherwise inexplicable flotation of a public company of ex-Apple execs with no products or services, who want to buy up companies using IP. Have you ever created a website or posted any materials on any website? YES NO (Circle One) If YES, describe the website(s) you created and/or the materials you posted. Have you appeared in any magazines, publicly disseminated photographs, advertisements or the Internet? Bill Gates endorsed Microformats at Mix '06 yesterday. Here's the clip in Windows Media format, and QuickTime format (thanks Brian). BILL GATES: Everything we do here has to be incredibly flexible, because you're going to be doing your own sites, you might want things that are specific to your industry that, of course, Microsoft isn't going to have those things, so you need total flexibility because you're addressing all the different layers of the stack there. And so all the interoperability standards here, whether it was XML to start with that we were a key part of giving that out as a standard, then the SOAP-level stuff, now we've moved up to a variety of techniques including Web services, all of those things are out there and free for people to use. Even the recent stuff that Ray has done about the simple list extensions, Live Clipboard, that's connecting up to everyone. TIM O'REILLY: That's true, that stuff really wowed people when he demoed it at our e-Tech Conference. I thought, you know, this whole idea of the semantic Web is actually starting to happen in small ways with microformats, and I thought the fact that Ray picked up on that was really nice, he got a really great response from the geeks who were my audience. BILL GATES: Well, I think his analogy that we've been exchanging data and had some standard formats within a machine, that he now would take that to, okay, let's exchange between different Web sites, it's going to take the idea of contact cards, scheduled appointments, set of directions, all these things where we move standard schema, we need microformats that people agree on, it's going to let that bootstrap. Because the more those things become standard, the more other Web sites choose them, and therefore the more popular they become. TIM O'REILLY: Right, so that you get the network effects that really allow us to weave applications together. BILL GATES: Right. And it's all very market driven. If some format is too rigid, then nobody is locked into that, somebody can come along and do something completely different. It's great to see the work we've been doing on Microformats being picked up. Here's me telling Ray Ozzie about them less than a year ago: Windows Media format. At eTech (and apparently at SXSW too), Bruce Sterling spoke about the power of names in forming our mental representations of things. 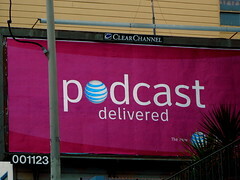 The example that leapt to mind is 'Podcasting', and seeing this AT&T billboard today brought it home for me. When we were talking about 'automatically downloading audioblogs' it took lengthy explanations for people to grasp it at all, but now radio stations and legacy telcos can blithely throw the word around and people get it at once. Jane turned on the radio, heard a great deal of encrypted traffic from banks, navigation beacons, and hams, and turned it off again. Funny what had happened to the broadcast radio spectrum. She turned on the car's music box. It held every piece of music that had ever meant anything to her, including stuff form her early childhood that she'd never managed to erase. Even with sixteen-digit digital precision, everything she'd ever recorded took up only a few hundred megabytes, the merest sliver in the cavernous memory of a modern music box. Jane played some Thai pop music, cheerful energetic bonging and strumming. There'd been a time, back in design school, when Thai pop music had meant a lot to her. When it seemed that a few dozen wild kids in Bangkok were the last people on earth who really knew what it meant to have some honest fun. She'd never figured out why this lovely burst of creativity had happened in Bangkok. With AIDS still methodically eating its way into the vast carcass of Asia, Bangkok certainly wasn't happier than most other places. Apparently the late 2020s had just somehow been Bangkok's global moment to shine. It was genuinely happy music, bright, clever music, like a gift tooth world. It felt so new and fresh, and she'd listened to it and felt in her bones what it meant to be a woman of the 2020s, alive inside, and aware inside. It was 2031 now. The music was distant now, like a whiff of good rice wine at the bottom of an empty bottle. It still touched something inside her, but it didn't touch all of her. It didn't touch all the new parts. Or in Richard Turnnidge's 1991 mockup of an interactive radio player. Sometimes ideas take a while to accrete enough cultural baggage to be built. Last night at eTech, I was chatting with Rohit and Chris about microformats browser integration. With our Microformats talk today coming up, Rohit said something like "our hCard and hCalendar demos work great on the Mac, but they don't get stuff into Outlook on Windows". This morning, Ray Ozzie demoed his Live Web clipboard. This gives a way to add a scissors button to webpages to copy structured data out, and a system tray app to translate to and from the native clipboard. This means you can take hCalendar and hCard data from the web into Outlook, into MSN's Live calendar application, and connect other apps data into and out of the browser in a nice user-obvious way. Great stuff. Michael Mealling works for a company that makes space rockets, and he has an idea for your next science fair - how about sending a kilogram into space and back for $250? If that sounds intriguing, they have a survey for schools (and homeschools) to fill in to see if they can get enough people together to fill a 100kg payload rocket. AT&T paid millions to run an ad that emphasises the wires in the network. If they do their job right, we are unaware of the wires. Conversely, Suw of ORG speaks clearly and coherently to DRI for 40 minutes on the threats to an open net. This is well worth watching - I learnt a lot and I've been trying to follow these issues myself. This also illustrates the deeper point - the net can as easily bring us video from a small group of thoughtful and engaged people as from a trillion-dollar corporation. The head of AT&T wants to take back the pipes from the open net, and stop us putting up video without paying them extra. Senator Ron Wyden introduced an Internet Nondiscrimination Bill today, which sounds encouraging. Here's my parody of the AT&T ad - with narration changed to say what they mean. PS A tip for Google videos in general. The default Flash player looks ratty and has trouble maintaining sync. Click on the 'Download for iPod' mpeg4 version and play that in VLC, iTunes or QuickTime Player. Why Google won't let us fast-start these I don't know.